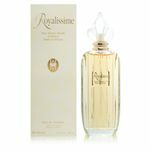 Created by renowned perfumer Henri d'Orleans, Royalissime is the fragrance fit for royalty. This feminine, light floral scent combines jasmine, gardenias, freesia, lily of the valley and ylang ylang. Very pleasant floral fragrance, I love it, it is very classic French perfume, but not as strong as the others. I personally don't think it is a perfume for young people (under 20) since it gives a hints of a mature and classic woman.